Where is the olive oil? Italian. The store didn’t have an obvious Italian section. Balsamic vinegar. I found shelf after shelf of balsamic vinegar, but no olive oil. Olives. Lots of bottles of olives (presumably swimming in their oil), but again no olive oil. Expensive stuff. I managed to find a small bottle of organic olive oil in the expensive stuff section. But I didn’t want to pay $8.49 for something that was going to be mixed in with salad dressing. Condiments. This was a long shot, but I figured there was a slight chance they shelved it near the ketchup and mustard. No luck. I gave up on my olive oil quest and decided to move to another item on my list — beer. As I was coming out of the beer aisle, I happened to catch olive oil out of the corner of my eye. 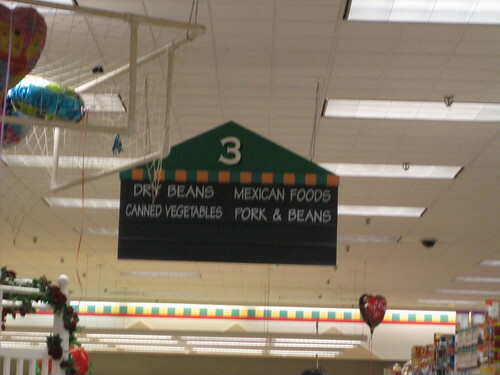 It was in a section labeled Dry Beans / Mexican Foods / Canned Vegetables / Pork & Beans. I don’t know why I didn’t think of that. If I were serious about finding olive oil I could’ve walked every aisle of the store methodically. (In database terms, a table scan.) Or, I could have asked an employee. Finding one might take longer than walking the entire store; and even after finding an employee, he might just end up walking the store with me. If I hadn’t stumbled upon it, I would have just walked out without it rather than spend 30 minutes walking the aisles. In the search world, we don’t have to worry about learning someone else’s organizational scheme to find things. Why can’t we have a terminal in the grocery store that lets us do the same? Type in “olive oil” and you see that it’s in aisle 3. If they didn’t sell it, I would know that, too. 3 Responses to Where is the olive oil? I will note, however, that sometimes, even knowing which aisle something is in doesn’t help you find it. You need to know where in the shelf spacing to look and whereabouts within the aisle itself. If the Web site is any indicator, shopping will not be “a breeze.” It won’t even let me enter a Zip code to check for locations. And, it’s a Food Lion business. Hmm.